We created first AI based on the theory of practopoiesis. See a live demo at www.RobotsGoMental.com ! Practopoiesis is a theory on how life organizes, including the organization of a mind. It proposes the principles by which adaptive systems function. One the same theory covers the life and the mind. It is a general theory of what it takes to be biologically intelligent. Being general, the theory is applicable to the brain as much as it is applicable to artificial intelligence (AI) technologies (see AI-Kindergarten.). What makes the theory so general is that it is grounded in the principles of cybernetics, rather than describing the physiological implementations of those mechanisms (inhibition/excitation, plasticity, etc.). Practopoiesis solves nine notorious long-standing problems in neuroscience and philosophy of mind. The main challenge to the traditional brain theory: The most important presumption about the brain that practopoietic theory challenges is the generally accepted idea that the dynamics of a neural network (with its excitatory and inhibitory mechanisms) is sufficient to implement a mind. Practopoiesis tells us that this is not enough. Something is missing. Practopoiesis also offers answers on what is missing, both theoretically and in a form of a concrete implementation. The theoretical answer is in T3-systems and the processes of anapoiesis. The concrete implementation in the brain is based on the neural adaptation mechanisms. These mechanisms enable us to adaptively deal with the context within which we have to operate and thus, to be intelligent. A thought results primarily from an adjustment of the brain hardware, and not from a computation executed by that hardware. The main contribution to the mind-body problem: Practopoiesis suggests that we should think about mind differently from how we are used to. According to T3-theory, the mind cannot be implemented by a classical computation, which consists of symbol manipulation within a closed system (a “boxed” computation machine). Rather, a mind i.e., a thought, is a process of an adaptation to organism’s environment. This requires the “computation” system to be open and to interact with the environment while a thought or a percept is evolving. The reason why we are conscious and machines are not, is that our minds are interacting with the surrounding world while undergoing the process of thought, and machines are not — machines recode inputs into symbols and then juggle the symbols internally, devoid of any further influences from the outside. 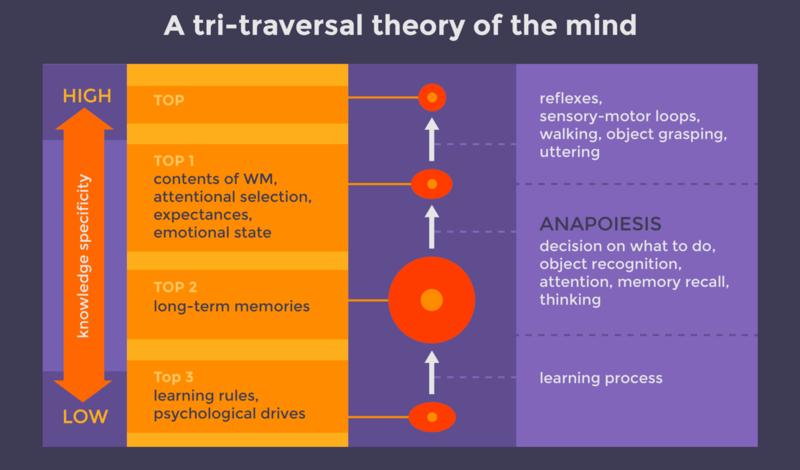 In other words, classical theory tells us that the brain first learns by navigating through error landscape where it finds minima, i.e., it optimizes its performance. After the learning, the brain “thinks” by simply performing mathematical mapping from set A to set B. This map can be also conceived as a deductive logical inference. In contrast, practopoiesis tells us that the brain does not use logical deduction (or mathematical mapping) to think. Rather, the thinking process also requires a navigation through an error landscape. The brain also optimizes its functions as it perceives, categorizes, decides, understands, and so on. This insight makes a big difference. Only a navigation through an error landscape involves feedback from the environment, while a mathematical mapping function does not, as it is limited to whatever information the map already has. This navigation through error landscape can also be interpreted as a fast learning process. Hence, the brain learns how to quickly learn. Only such a learning-to-learn brain can implement a much more advanced abductive logic, as opposed to the mere deduction. For those versed in dynamical system theory: The classical explanation of the brain presumes that there is a set of equations that describe the mathematical mapping from sensory inputs to motor outputs; and these equations are supposed to be the mind. That way, a thought would be a necessary component of each iteration of a dynamical system. In contrast, practopoiesis tells us that a mental operation is more like a process of changing the parameters of those equations, and that a new thought occurs—i.e., a new percept, idea, or decision is being made—only when this dynamical system exhibits a phase transition, that is, only when it undergoes a bifurcation. Here is a list of differences between the classical and the T3-approach towards explaining the emergence of the mind (described in more detail in Nikolić 2015). The reason why we are conscious and machines are not, is that our minds are interacting with the surrounding world while undergoing the process of thought, and machines are not — machines recode inputs into symbols and then juggle the symbols internally, devoid of any further influences from the outside. Empirical predictions: The key prediction of practopoietic theory is that cognition is implemented by the mechanisms of neural adaptation (and sensitization). It is not the widely-assumed network computations that produce cognitive operations. Instead, it is the mechanisms responsible for adapting the neural responses that create our perception, attention, decision making, capability to consciously understand, etc… The network dynamics serves its obvious function: delivering information. But it is the mechanisms of neural adaptation that ultimately give rise to minds inside our heads. Theoretical tools: In practopoiesis there is no longer a cycle: action->representation->action… . Instead, practopoietic theory works with actions only, representations being implicit. That way, practopoiesis operates non-symbolically. It is a cybernetic system, not a representational system. As a result, instead of producing symbols, execution of a mental operation results in creation of an action system. In other words, what occurs is poiesis of praxis (hence the name practopoiesis): Operations of one mechanism for acting create another mechanism for acting. Practopoietic hierarchy: To understand the mind, we need to understand how these action mechanisms form a hierarchy: One action system is in a service of another. The action hierarchy begins with actions of gene expression mechanisms and ends with our overt behavior. Learning and cognitive functions are implemented as actions that operate at intermediate stages. The entire theory is founded in the cybernetic theorems of requisite variety and good regulator. Advantages of cybernetics: There are several advantages of grounding theories in an abstract, cybernetic way. One advantage is the applicability of the theory to system relying on different physical implementation e.g., brain vs. other organs, artificial intelligence algorithms, control systems, etc. Another advantage is the ability to detect what is missing in our current theories. In fact, an important contribution of practopoietic theory is the insight that our classical approach to organization of the brain — based on neural networks and the learning mechanisms for the connectivity of those networks — is not sufficient. One additional adaptive mechanism is needed and only then can we explain or mimic biological-like intelligence. The formal theory is presented in this paper downloadable from arXiv.org. … it is the mechanisms of neural adaptation that ultimately give rise to minds inside our heads. For those who need to strengthen their ability to think in terms of cybernetics, I can recommend the following review paper on cybernetic theory. Two explanatory steps: Practopoietic theory consists of two parts. The first part is the foundation. This is where the basic principles of adaptive systems are formulated. These principles can be applied to various biological processes, not only to the brain. Also, the first part can be applied to non-biological systems, such as AI. The second part applies those principles to human mind and to the mind/body problem. The second part explains the ways in which the mind is special and different from any other adaptive system. The manuscript on practopoiesis discusses a number of implications for the mind-body problem. – How does a practopoietic system become aware of the surrounding world? Implications for artificial intelligence and machine learning in AI-Kindergarten. Testing the theory of practopoiesis using closed loops. In: Closed Loop Neuroscience. Ed. Ahmed El Hady. Academic Press. Journal of Theoretical Biology Volume 373, 21 May 2015, Pages 40–61. The brain is a context machine. Review of Psychology, 17: 33-38. – See also publications related to AI-Kindergarten. – Interesting: anapoiesis explained through poetry, making it a practo-poetry, by Niklas. neuroscientist: It may direct you towards what your data were telling you but you may not have yet noticed. psychologist: It may equip you with a set of rules that can describe anything mental. biologist: There may be an even more general set of principles than those of the theory of evolution. computational neuroscientist: It may tell you about the equations that your model was missing. philosopher: Philosophy of mind and the science of the mind may be finally able to speak the same language. AI researcher: It may give you an idea on what it takes to breathe life into your AI. generally interested in learning cool stuff: You may learn something truly new.